We don’t grow sweet corn on our farm — it takes too much water, and it’s a finicky crop, and in the past when we’ve grown it we’ve been inattentive and failed to harvest it at the critical moment. So we leave corn-growing to the specialists, and when we want corn we buy it, or barter for it. This year we tried the varieties of sweet corn available at the farmers’ market — So Sweet, Milk ’n Honey, Even Sweeter, Candy Store, and Sweet Heart. 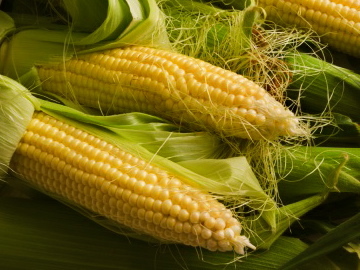 All of these newer varieties have the sh-2 (supersweet) gene, which causes the kernels to develop an extremely high sugar content. To me, they taste too much like candy, and not enough like corn. I asked one of the old farmers why he was growing these instead of the classic varieties like Golden Bantam and Trucker’s Delight. “Oh, that’s what everybody wants nowadays,” he said. Not everybody. I guess if I want corn that tastes like corn, I’ll have to grow it myself. The supersweet gene isn’t showing up just in corn. There are supersweet varieties of carrots and beets, grapes and apples. When sugar overpowers flavor, it becomes difficult, with your eyes closed, to tell a Red Flame grape from a Fuji apple from a Lutz beet from a Sugar Baby carrot; all of them are crunchy sugar. And as the tools of biotechnology are put to work, we can expect that extra sugar will soon appear in all sorts of unlikely places — peanuts? tomatoes? onions? I was chatting with the checkout girl in the supermarket one day while she rang up my groceries, and I asked her what was the most popular item in the store. Cap’n Crunch cereal. Sixty percent sugar and crunchy. I wonder if fruit and vegetable breeding isn’t sloping downward toward some lowest common denominator of human taste. Cap’n Crunch. Instant gratification for a spoiled child.